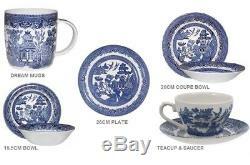 SET OF SIX CHURCHILL BLUE WILLOW DINNERWARE. Size (Diameter x Height): D-20cm x H-4cm. SET OF 6 TEA CUPS & SAUCERS. PERFECT PRESENT FOR X-MASS, WEDDING, NEW HOME, OFFICE. A set of 6 plates of 26 cm diameter. 20.8 x 20.1 x 16.5 cm. Colour: Blue Material: Earthenware SET OF 6 VINTAGE STYLE. ALL ITEM COMES IN SET OF 6, PLEASE CHOOSE FROM DROP DOWN MENU. We aim to get your ORDER to you as FAST AS POSSIBLE! We make sure your order packed professionally & watchfully and dispatched in timely manner. Note: Our Standard P&P is for UK & Mainland only. Please bear this in mind when chasing your order. We are a leading supplier deals with wide range of house hold items, Toys and many other items.